How do you organize your Google Drive? One of the first questions teachers new to Google Drive always ask me is, how do you organize your files. I've gone through several different ways before figuring out what works best for me. Here are some options. I teach high school, so I have a number of different sections and sometimes more than one course to teach. I also teach a graduate class and have a few other projects going on. 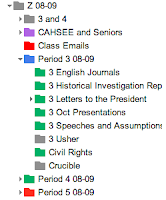 Option 1: Create a file for each period and then subfiles within that for each assignment. This was my first attempt to organize my digital student work, but it had problems. Generally the more layers and separate folders you have, the slower your work flow gets. And I had to spend a lot of time moving student work into the right folder. Don't even ask me what happened when a student changed from one class to another. 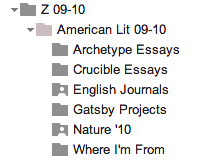 Option 2: Create a folder for each new assignment and put all the student work from that assignment into that folder. This made it much easier to find and review all of the short stories for instance. But, I still spent a lot of time adding student work to that folder. Option 3: Stop putting student work in folders. Really. This is the system that is actually working the best for me now. 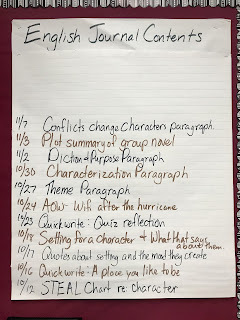 When my class starts an essay they name it according to a strict naming convention, typically period# name and assignment title, so if James is in period 3 the file name for his paper is "3 James Short Story"
I can also find a student's work by typing the student's name into the search box. The search will return any document that has that student's name in file name or even anywhere in the document or spreadsheet. Some of my results when I search for Adrian are below. Typing in the name of the assignment will get me all the papers with that assignment title too. The next evolution for my Drive organization and student work will likely be Doctopus. Thats a script that runs in a Google spreadsheet. 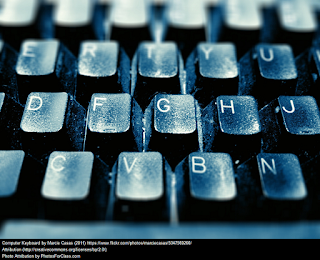 It will automatically create and share a copy of a document with all of my students. As it does so, it names the docs as I specified and puts the created documents into a folder. Because of that my student work will be back in folders, but as long as it's automatic and saves me time I love that. I do use folders for most things that are not student work. I have a shared folder with my colleagues who teach the same course and we use it to organize materials for our unit. It's crucial to be able to group all the docs for the same unit together that way. I also use "View Only" folders to send things to my classes. Read about how "View Only" folder work. And then there is the preview feature. I use it all the time to review student work quickly. Select one doc in the docs list. Look for the eyeball icon and click it. You will get a preview page of that doc. The best part is that you can use your right arrow to see the next paper, and the next. Use the up and down arrows to scroll in the document you are previewing. It's fabulous. Previewing the document. Note the blue open button if you want to edit. 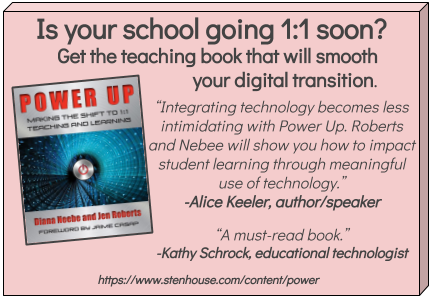 You are probably really fed up with email notifications that your students have shared a document with you. You have probably begged your classes to uncheck the box that says "send email notification", but you still get way to many. You need a filter. In Gmail select one of the "I've shared..."emails. Then click on the "More" button and choose "Filter messages like these"
Delete the sender info in the first box and add "I've shared an item with you." to the "has the words" box. Select "skip the inbox, mark as read and apply the label." When you choose the label create a new one called "I've Shared". 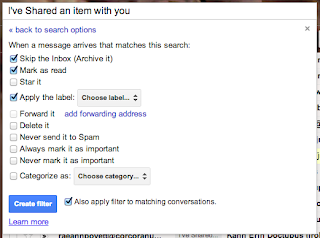 Also check the box to "apply the filter to matching conversations"
This should send all your docs email notifications to a separate "label" on the left side of your gmail inbox. 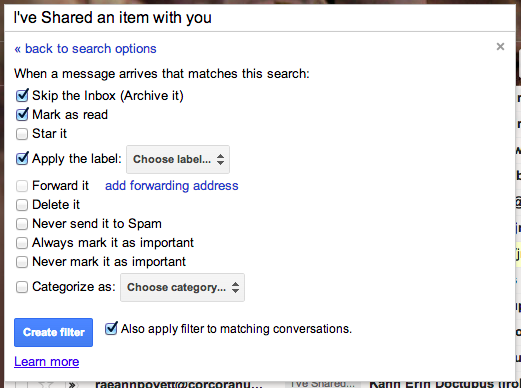 Filters are a great way of managing your incoming Gmail.